We all get comfortable with our good-old office furniture. No matter how out of style it is, or how inefficient it has become. It’s like an old friend that one has to make excuses for. But eventually, when things get too out of hand, your old office furniture starts to actually become a business liability. At this moment in time, one will have to finally make a decision about breaking down and buying some new office furniture. Here are four telltale signs to look out for, which will prove when one is desperately in need a new office decor change, which is modernly styled, and immensely more functional. That 300lb gray metal desk, which takes four maintenance workers to move, might be a good candidate for a trip to the recycling center. Desks today come in both standing and sitting variations, and the best of both worlds, height adjustable and motorized units can accommodate both, depending on one’s preference at the moment. Those ripped up chairs that don’t even roll right anymore, might also be candidates for the junk heap. Relaxing in a chair doesn’t have to be a thing of the past, not with so many modern ergonomic styled brands to choose from. Wear and tear are an inevitable factor in any office furniture’s shelf life. The trouble is, that your office furniture represents not just your office, but your entire business as well. Don’t be perceived by a client as being outdated, just because your office furniture is. The biggest clue that it’s time to replace your office furniture is when you give your cubicles and furniture a deep cleaning – And they still look like hell. This tells you that you have reached the end of the line when it comes to hiding the fact that you need new furniture. Don’t waste your money on fixing up junk. Break down and buy new furniture, you’ll thank yourself later when your new, functional, productive, eye-appealing, and comfortable office furniture arrives. Old and decrepit office furniture isn’t just ugly, it’s dangerous as well. All those aches and pains at the end of the day can add up to permanent injuries or health problems eventually for the office worker. Old chairs with strategic pieces missing compromise one’s posture, putting extra pressure on one’s back muscles and joints, plus it also slows one’s metabolism, adding to the risk of deadly blood clots forming, which could dislodge, wreaking havoc on vital organs, or worse, the brain, causing a deadly aneurysm. Yikes! No one want’s to risk that! Cubicle panels with sharp edges which have come undone, cause a cutting hazard. Metal desks or filing cabinet drawers with that pinch or crush your hands, or chairs that fall back too far, risking a fall, all have no place in a safe working office environment. They are not only a dangerous liability to one’s office, but also a potential insurance nightmare as well if someone sues for damages after being injured at work. Can’t adjust your office chair properly. Is your back out of whack because of no lumbar support anymore? Can’t adjust up or down for proper posture? Drawers stick on your desk, causing an office ruckus every time you have to wrestle that sticking filing cabinet that won’t open? Does your stand up adjustable desk, only to sit down due to a faulty adjustment mechanism? All these office furniture gigs, add up to the UN-adjustables’ running and ruining one’s daily office life, instead of the office worker running the show. If this is the case at your office, then it is well past time to take back your office from the UN-adjustables,’and get new office furniture that adjusts the way it was designed and supposed to in the first place. There have been so many ingenious new developments in modern office furniture, with ergonomics being incorporated into almost every piece of office furniture these days. One will find that new office furniture incorporates versatility, adaptability, and, of course, productivity into virtually every piece of today’s modern office furniture made. It is time to put adjustability, back into your daily office routine. Once you go back to office furniture that adjusts properly, you’ll never want to put up with broken Non-adjustable office furniture again. That wobbly desk, that chair that’s about to fall apart. That filing cabinet that threatens to fall over and smash some toes every time you open it. The wobbles are irritating and extremely counterproductive when one has to fight with the equipment just to use it. All of these things are liabilities to an office. Nobody likes the wobbles, especially not office workers. Having the wobbles throughout one’s office workspace is a sure telltale sign that the office needs a makeover. Broken office furniture is disabling to the production capabilities of an office and is also not fair to employees who deserve a safe, comfortable, productive working environment that provides up to date functioning office furniture in order to do their daily work properly. You wouldn’t expect a policeman to speed to a call with a broken siren, a fireman to put out a fire with a hose with a bunch of holes in it, or a soldier to fight with the firing pin missing from his rifle. The standard office worker’s job may not be as dangerous or exciting as the three professions just mentioned. But an office worker shouldn’t be expected to work with faulty equipment either. Give up the past by getting rid of that old embarrassing 80’s style broken down office furniture; you will be glad that you did, and so will the rest of the office. As a boss, or even as your own boss at a home office, it is time to decide on replacing that old office junk with modern, innovating, productivity rejuvenating, new office furniture for the new millennium. I think everyone who has had to move an office before can agree, that moving is one of the most stressful, unpleasant ordeals, which anyone will ever have to experience. So many factors add up to make the move a monumental task that requires planning, and an ungodly amount of mind-numbingly confusing packing and labeling right before the chaos of moving, and then more chaos unpacking and setting everything back up again. Moving doesn’t have to be like this, though. With these five simple tips, your office move can run smoothly and efficiently, and also have your business back up and running in absolutely no time. Planning a commercial office move, or the lack of it, is the most important aspect of a move that can either make it or break it. Proper planning is the difference between extended downtime, and jumping back into active business on time. Waiting until the last minute is paramount to a disastrous move. It is not uncommon for a business to start planning the move up to six months in advance. If one is planning on hiring out for things like movers and trucks, also make sure that all the proper insurance responsibilities are covered by all parties involved. Remember also, that most office buildings will discourage moves during business hours, so try to schedule your move on a weekend if possible. Make sure to do a walk-through of the new site in order to document all relevant entry points, loading docks, and elevators, service or otherwise, in order to give your workers convenient and concise instructions. Draw maps if necessary, so that everything is clear and concise to everyone. This will ensure a smooth transition on move day. If you decide to hire a professional packing service, make sure to source them first on issues such as their experience in commercial moving. An office move is nothing like a house move, it requires a professional degree of expertise. Make sure to ask exactly what their capabilities are. IE: Are they able to properly dismantle electronics, office furniture, and other technical tasks. It is better to find out what their capabilities entail first, rather than to find out later that they do not have the knowledge to do the job right. Sometimes, there are extra or unneeded items that are not worth taking along with the move, or don’t fit the new floor plan. Make sure to clearly mark these items and have them separated from the rest of the things to be moved. These unwanted items can either be sold, or they can be donated to a charitable outfit for a healthy tax break – Just remember to ask for a receipt with the approximate value of the donated items for tax deduction. 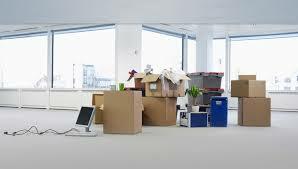 During the actual moving process, it is advisable to hire a professional moving company to move your office, rather than use your employees to do it, or casual laborers. Workers from a temp agency, or even worse, people off the street will not have any incentive or the motivation to do the job quickly, efficiently, nor respect your valuable equipment. A professional moving company has a reputation to uphold, and also the right insurance, licenses, and bonds to cover any damage that may occur. It is simply not in the employee’s job description to move an office, and if something is damaged, there is no recourse for reimbursement other than firing the worker, plus facing the resentment of some staff members for making them work the move. It is wise to designate two moving supervisors, one at the old site, and one at the new site, in order to make sure everything is smoothly moved and received. Designate a competent worker to set-up and test the data cables at the new office, so that when the IT team comes, everything will be ready for them to install the lifeblood electronics that will get your business back up and running again. If the lease is not up yet once you have moved out of the old building, one should make sure to set the thermostat on the “vacant” setting. This will hold the unit above freezing, but below 65%, saving money on electricity. Organizational skills are going to be your best friend when being faced with the daunting chore of unpacking an entire office, and then laying out a new office floor plan. First, take an inventory of all your office materials, desks, chairs, shelves, etc. This way you will have a greater idea of what you are dealing with. This will also allow you to see if anything went misplaced during the move. If you do not have an office floorplan yet, it is essential that you make one. Draw the measurements of the new office and place on the sketch every piece of office furniture where it needs to go. This will let you know ahead of time if everything is going to fit. The rest, of course, is the hard work of setting everything up in the office for real, according to your detailed map. This is where hired labor will come in very handy. Make sure to keep cords and cables secured and out of the way for proper safety, before setting up the rest of the office. Also, make sure to factor in the lighting before setting up the workspace. The furniture, then needs to be set up first, of course, before installing all of the computers, phones, printers, fax machines, and copiers. Then it’s time for the little details such as all the sundry office necessities like paper, notepads, pens, and printer ink which can then be put in their place. Your office floorplan should already have set workstations, conference rooms, break areas, and such, in its layout. Lastly, after everything is set up, make sure to test its efficiency before the first workday. This will tell you if anything doesn’t work the way you thought it would. Some things look good on paper, but in actuality, do not measure up the same.